A gift guaranteed not to collect dust on the shelf! This stunning crystal memory uses the latest technology to create a gift she is guaranteed to have never received before! 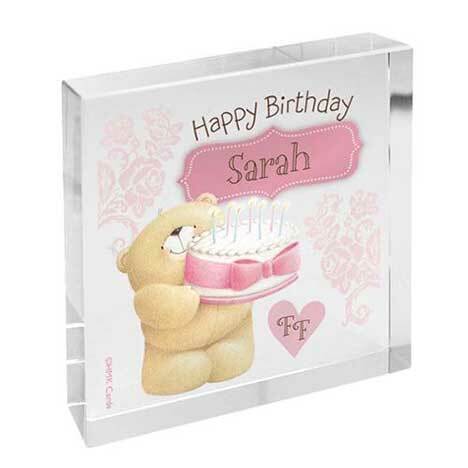 This stunning Forever Friends crystal memories token is beautifully decorated with the loveable Forever Friends bear that has been hugging his way onto gifts for over 25 years. She will be so proud to see your sentimental words adorning her shelf reflecting every element of natural light that enters the room. Sent in a black gift box, there is no need to worry about how to present your precious gift. Personalise this Forever Friends Crystal Block with any message using up to 20 characters and any name using up to 12 characters. Due to the nature of this product and the font type used please refrain from using all capitals in your personalised message as unfortunately this may result is personalisation being missed off.